*LeBron James will announce his future NBA team within the first 10 minutes of Thursday night’s hourlong ESPN special devoted to his decision, the network announced Wednesday. Sportscaster Jim Gray will host the introduction, announcement and questions, stated Norby Williamson, the cable network’s vice president of production. Gray was specifically chosen by LeBron’s camp, who pitched the special to ESPN execs last week. ESPN says Gray and James will be together in one location, but provided no further details. The Associated Press, however, quotes a source familiar with the plans as saying the special will take place at the Boys & Girls Club of Greenwich, Conn. Commercial proceeds from the broadcast will benefit the organization. The James hour will also include a long-form interview with LeBron by Mike Wilbon of ESPN’s “Pardon the Interruption” and others via satellite from ESPN’s studios in Bristol, Conn.
What? nightshift Lebron has lived up to the hype and then some. The only thing he hasn’t done is win a championship and he’s still young. What is all of this fanfare for a 5 to 10 min annnouncement? LeBron state your decision and go home. If Jesus Christ was about to speak on saving souls do you really think he would receive such media coverage? Seriously, he is the ONLY one who deserves this much ATTENTION. FINALLY….Folks been talkin’ about this for TWO YEARS! Let us hurry up and get this out the way so that we can get on with our lives! PLEASE!!! I could not agree with you more smitdawg. The world has to stop for LeBron. But you know what?? It’s not gonna end after tonite. Then…we’re gonna have the dramatic build up to when he dons his new uniform (…that is…if he signs with another team and more than likely that will happen). And that’s gonna drag on all the way up ’til Game 1 tip off in early November. 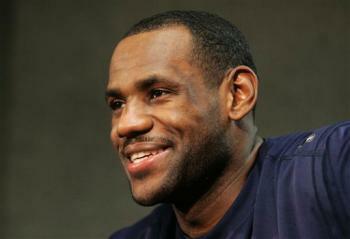 Possible spoiler alert….Chris Broussard (ESPN) reporting that Lebron’s goin’ to Miami. TesticAl….are you nervous?? It all seems a bit harsh seeing that he is also doing it for charity. But how is it any different from the Brett Favre yearly sagas, when he would give the media the run around, then call a press conference to announce his decision? The media has no room to complain now, they are the ones who have reported on everything he says and does and baout his not making it to the NBA Finals etc. The reports have been ad nauseum. Tone it down Brotha, tone it down. Dont buy into the media hype about yourself- its open season on black male athletes in the media. As quick as they build you up- they tear you down twice as fast.